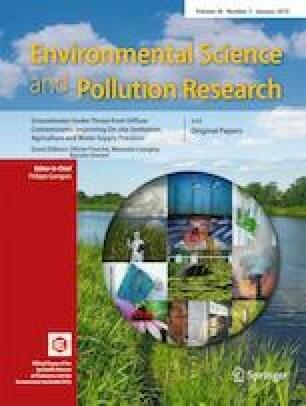 To evaluate the possible effects of habitat type on crustacean plankton (hereafter zooplankton) biomass and body size, a 5-year study (2011 to 2015) was conducted during wet seasons in three habitats in Lake Poyang, China. The lacustrine habitat with the most stable hydrologic regime had the highest zooplankton biomass coinciding with the highest phytoplankton biomass. The riverine habitat with the lowest Secchi depth overall had the largest zooplankton body size, but high zooplankton biomass only in high water level years. The seasonally inundated floodplain habitats had the lowest zooplankton biomass and the smallest individual body size, coinciding with the lowest phytoplankton biomass and the highest predation pressure, the latter indicated by a low zooplankton: phytoplankton biomass ratio (ZB:PB). Multiple linear regression analyses indicated that pelagic zooplankton assemblages were primarily influenced by phytoplankton biomass in lacustrine habitat, by advection and turbidity in riverine regions, and by predation pressure in seasonally inundated floodplain region. We conclude that the importance of bottom-up and top-down effects on zooplankton biomass and body size varied with habitat type in Lake Poyang. The online version of this article ( https://doi.org/10.1007/s11356-018-3658-7) contains supplementary material, which is available to authorized users. Numerous studies of the spatial distribution of crustacean plankton (hereafter zooplankton, including cladoceran and copepod plankton) have been conducted in lakes (Patalas and Salki 1984, 1992; Romare et al. 2003), rivers (Bass et al. 1997; Kim and Joo 2000; Thorp and Mantovani 2005; Wahl et al. 2008), and reservoirs (Bernot et al. 2004; Bini et al. 1997; Horn 1991; Masundire 1997; Naselli-Flores and Barone 1997) during the past decades. As zooplankton is food for fish and also grazers for phytoplankton in the trophic web, the effect of phytoplankton biomass (bottom-up) and predation (top-down) on the zooplankton assemblage structure have been studied extensively (Brooks and Dodson 1965; Havens et al. 2009; Jeppesen et al. 2000; Zaret and Kerfoot 1975). It is well known that phytoplankton and zooplankton biomass overall are positively related and that zooplankton community assemblages and size structure can be highly influenced by predation (Brooks and Dodson 1965; Dumont 1994; Jeppesen et al. 2000). The biomass ratio of zooplankton to phytoplankton (ZB:PB) has been widely used as an indicator of predation pressure in both temperate and subtropical lakes (Hart 2011; Havens and Beaver 2013; Havens et al. 2009; Jeppesen et al. 2003). Based on a study of 466 lakes, Jeppesen et al. (2003) argued that the ZB:PB (or predation risk for zooplankton) is unimodal related to total phosphorous in the north temperate zones, being low (high predation) in both the most nutrient-rich and the nutrient-poor lakes and high at intermediate nutrient levels. Compared with temperate lakes, however, the ZB:PB in subtropical lakes is relatively low and dominated by small size zooplankton taxa, inefficiently filtering large-sized phytoplankton, such as cyanobacteria (Havens et al. 2009). Large lakes in subtropics and tropic subjected zones are often have high variable hydrological regimes spatially (e.g., flood pulse, current velocity, water retention time) (Patalas and Salki 1992), which affecting zooplankton community assemblages (Baranyi et al. 2002; G-Tóth et al. 2011; Thorp and Mantovani 2005). While the role of macrophytes for zooplankton distribution in lakes have been extensively studied (Meerhoff et al. 2012), much less is known about the effects of top-down and bottom-up forces on zooplankton assemblages in lakes that are highly influenced by variation in hydrology, both spatially within the lakes and among years (Otto et al. 2014). 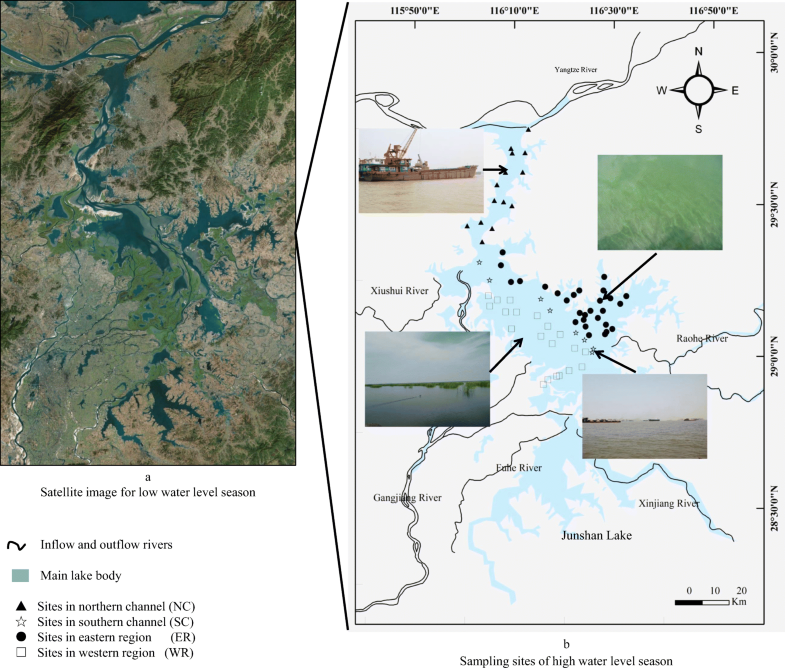 We conducted a 5-year study of zooplankton biomass and body size in different habitats in the wet summer season 2011–2015 in China’s largest freshwater lake, Lake Poyang, which is a river-connected, integrated floodplain ecosystem. Our hypothesis was that zooplankton were influenced significantly by both food sources (phytoplankton) and predation in the most lentic part of the lake, while physical factors would be of higher importance in the riverine part. Finally, predation would be of key importance in seasonally inundated areas covered by macrophytes, as these plants expectedly would attract numerous small fish, as seen in other warm lakes (Meerhoff et al. 2012). Lake Poyang is located in the Jiangxi province, China, at the south bank of Yangtze River (Fig. 1). It is the largest freshwater lake in China with a catchment area of 162,225 km2 and links to the Yangtze River (Ye et al. 2013). The bottom elevation of the lake ranges between 7 and 19 m (above sea level (a.s.l. )), with ~ 80% of the area being between 12 and 17 m a.s.l., while the low-elevation (7–12 m a.s.l.) regions only account for 12% (Feng et al. 2011; Li et al. 2014). The elevation of the lakebed generally decreases from south to north (Fig. 1(a)), with a difference of about 6.5 m (Li et al. 2014). The fluctuations in water level may be as high as 10 m within a year, and, consequently, the surface area may change from 3000 km2 in the wet seasons but shrinks from a lake-like system to a river-like one in the dry seasons (about 600 km2). During wet seasons, three typical types of habitats can be found in Lake Poyang: main channels (riverine), backwater lakes (lacustrine), and large areas of seasonally inundated alluvial lands (floodplain) (Fig. 1(a)). We, however, divided the lake into four zones, by subdividing the riverine part into two, the northern channel (NC) and the southern channel (SC), both subjected to high current velocities and busy traffic and being inundated for the whole year. The largest difference between NC and SC is their connection with lentic areas. SC divides the south of Lake Poyang into two well-connected parts (east region and west region). All inflow rivers run directly into SC, converging into the narrower NC connected to the Yangtze River. The west region (WR) consisting of seasonally inundated alluvial areas. The gross annual water discharges of the five inflow rivers account for 85% of the total water input to the lake (Gao et al. 2014). Ganjiang, Fuhe, Xinjiang, Raohe, and Xiushui contribute in average, respectively, with 55%, 12%, 14%, 9.3%, and 9.2% of the inflow sources (Zhu and Zhang 1997). Most of the water from SC run through WR, forming the seasonally inundate wetland. It is also recognized as a wetland of international importance for its remarkable biodiversity and habitat for various rare or endangered species, such as Yangtze finless porpoise, Siberian crane, and Oriental stork (Lai et al. 2014). Now, WR is the only region of the lake that has macrophytes in summer (Huang et al. 2002; Jian et al. 2015). Finally, the east region (ER) includes many backwater lakes that are connected to the main lake during high water level seasons and are relatively independent from the main channel during low water level seasons. ER once had dense macrophytes (Guan et al. 1987; Guan and Zhang 1987), but they disappeared several years ago. Sampling was conducted over a 5-year period (2011–2015). As the water level and lake surface varied between years, the number of sampling sites (Fig. 1(b)) ranges from 34 to 67 (34, 56, 57, 66, and 67 from year 2011 to 2015). The NC was not sampled in 2011. Two sub-surface water samples at 0–1 m depth were obtained using a 5 liters (l) hydrophore (APHA 2005). This sampling procedure is not accounting for depth segregation (vertical migration). Our sampling procedure may potentially lead to incorrect biomass estimation, although we would not expect so as the water current is relatively high in the riverine lake and the water furthermore is turbid (less need for avoiding predation by staying deep in the daytime). The sampling strategy was selected to avoid anchoring-up at each site (strong current) when sampling. To assess the effect, we conducted vertical sampling at 11 sites (see appendices). We found no significant gradients in zooplankton biomass (Appendix 1), body length (Appendix 2), and community structure (Appendix 3). This may result from high speed of water velocity, which averaged > 0.2 m/s making passive movement more likely than active movement. The samples (10 l) were filtered through a 64-μm mesh net, and preserved in 50-ml polyethylene plastic bottles with 4% formaldehyde solution. Zooplankton with few numbers (< 200) were counted entirety under a dissecting microscope (at x 40-100 magnification), otherwise, sub-samples were used until 200 individuals were counted. Most Cladocera zooplankton were identified to species level following the keys (Jiang and Du1979). Species which could not be distinguished in routine counting (Appendix 4) were identified to genus level. The copepod zooplankton were separated into adult Calanoida, adult cyclops, copepodites, and nauplii. Zooplankton body lengths were measured for the first 20 individuals (if enough, otherwise measure all of them) of each species per sample using the “S-EYE” software. Size dry weight relations (Dumont et al. 1975) were used to calculate the dry biomass of zooplankton in 2012, 2014, and 2015. In 2011 and 2013, when zooplankton size was not measured, the biomasses were calculated from the mean value for each species in the other years (Appendix 4). The zooplankton biomass and body size in 2011 and 2013 may be estimated biasedly. While considering zooplankton mostly dominant by Bosmina and juvenile copepod, the system error may have a minor effect on horizontal distribution patterns. We measured water temperature, pH, conductivity, water depth, Secchi depth, chlorophyll a (Chl a), total nitrogen (TN), total phosphorous (TP), and chemical oxygen demand (COD) according to standard methods as described by (Liu et al. 2015a, b; Wu et al. 2013). Water level at Hukou station was recorded from the website of Water Resources Department of Jiangxi Province (http://www.jxsl.gov.cn/slxxhw/jhsq/index.html) by Lake Poyang Laboratory for Wetland Ecosystem Research. A two-way analysis of variance (ANOVA) with nonparametric tests was performed in order to compare the spatial and temporal differences of environmental parameters, zooplankton biomass, and body size. While only main effects of spatial differences were used for environmental parameters, of temporal differences were used for zooplankton biomass and body size in the result. Horizontal distribution patterns of zooplankton dry weight biomass and mean individual body weight were visualized by a geostatistical method of inverse distance weighted (IDW) interpolation. Data was first explored using linear regression with scatter plot. In addition, we ran multiple linear regression analysis with forward selection to identify the most important environmental variables influencing zooplankton biomass and mean body size. Before and during the process of multiple linear regression analysis, collinearity diagnostics was checked by Spearman correlations (ρ < 0.60) and variance inflation factor (VIF < 5) respectively. If necessary, loga (bx + 1) transformation was undertaken to obtain normal distribution. ArcGIS 10.3.1 (USA), Statistical Program for Social Sciences (SPSS-IBM, New York, NY) 20.0 and OriginLab9.0 (USA) software packages were used in the data analyses. NC and SC had the highest water depth and WR the lowest (Fig. 2). The water level was by far lowest in the dry year 2011, being about 4 m below the 10-year average (2004–2014), while it was higher than this average in 2012, 2014, and 2015. 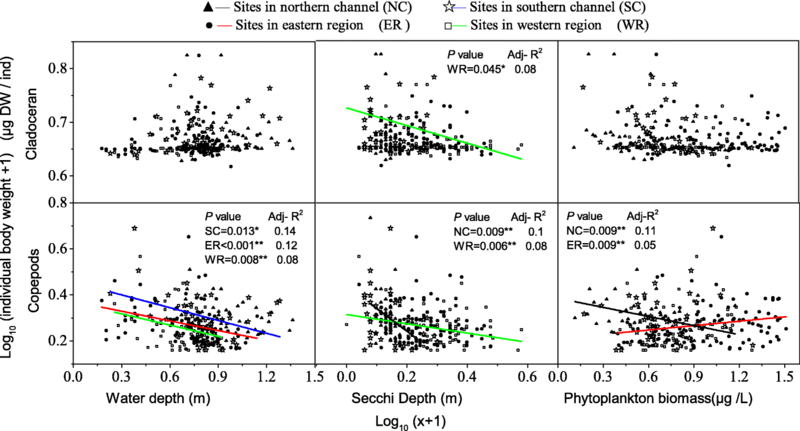 Significant differences were found in Chl a, Secchi depth, COD concentration, and pH between the different regions (Fig. 3), but not in water temperature, conductivity, and nutrient concentrations. ER had the highest Chl a concentration, COD concentration, and pH, while WR had the highest Secchi depth. NC and SC had the lowest Secchi depths and Chl a concentration. The lowest Secchi depth were caused by turbulent in NC and SC. No differences between the two channel regions, NC and SC, were found for any of the chemical variables analyzed. The zooplankton biomass varied between the five study years and regions (Fig. 4). Zooplankton biomass was significantly (ANOVA, F = 10.9, df = 4, P = 0.001) higher in 2013 than in the other years. Horizontally, the highest biomass was reached in ER (134 μg/L), followed by NC (85 μg/L) and SC (46 μg/L), and the lowest in WR (30 μg/L). The biomass was overall higher in ER than in WR. The lowest biomass was always found in WR, whereas the highest value occurred in ER in 2011 and 2013, and in NC and ER in 2012, 2014, and 2015. NC had relatively high biomasses only when the water level was higher than average in normal years (Fig. 2a). The copepod and cladoceran biomass distributions were rather similar to each other (Fig. 4). The zooplankton body size was overall larger in low water level years such as 2011 and 2013, and there was a decreasing trend in body size of copepods from 2011 to 2015 (Fig. 5). Horizontally, WR overall had the smallest body size and NC the largest. The low water level year, 2011, had the largest copepod body size and smallest cladoceran body size. Water depth only had significantly positive relationship with zooplankton biomass in NC and WR (Fig. 6); in a multiple regression, however, the water depth relationship with cladoceran biomass became significant also for ER (Table 1). The slopes of the relationship between cladoceran and copepods versus water depth were significantly higher in NC than in the other regions. 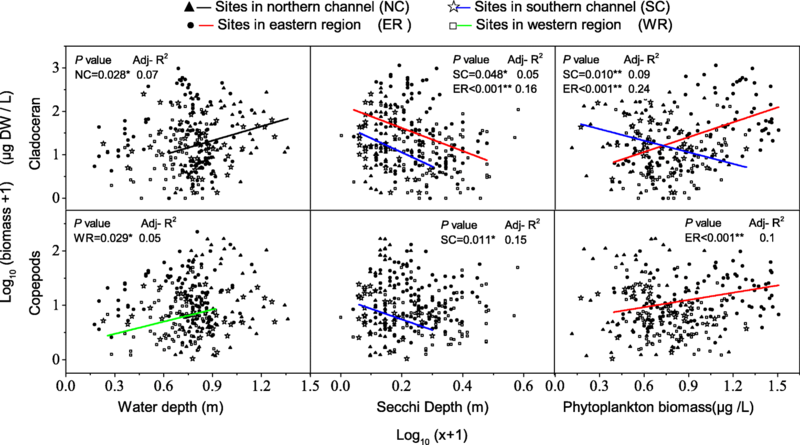 Cladoceran biomass exhibited a significantly negative relationship with Secchi depth in ER and SC, but for copepod biomass only in SC (Fig. 6); in a multiple regression, the relationship in NC became significant too, but positively (Table 1). 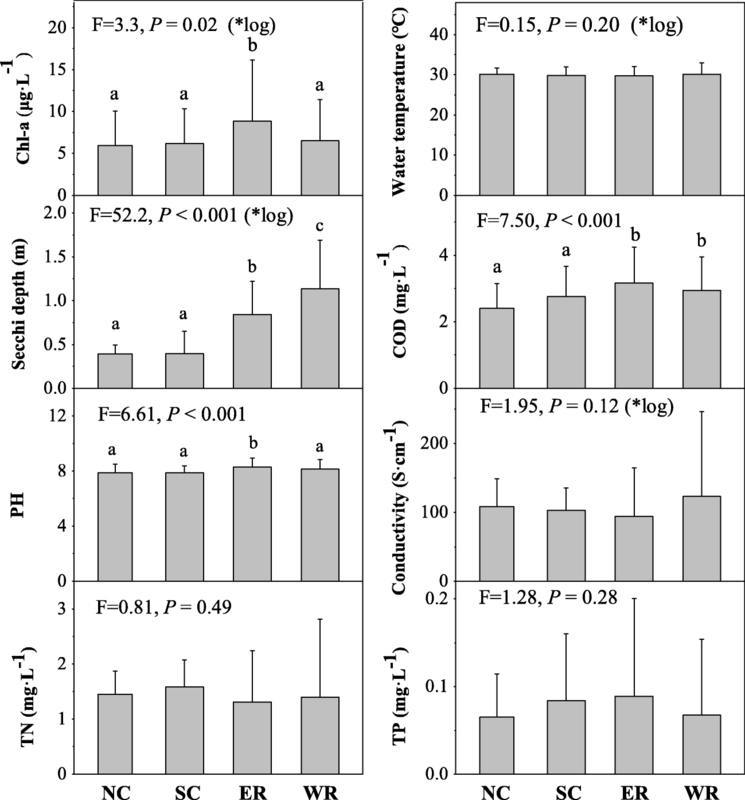 On the contrary, cladoceran biomass exhibited a significant positive relationship with phytoplankton biomass in ER and SC, while for copepod biomass only in ER (Fig. 6); in a multiple regression, the relationship becomes significantly negative related in NC. Body size of copepod in SC, ER, and WR had significantly negative relationship with water depth (Fig. 7); in a multiple regression, the relationship became significant negative for copepods in SC and ER, while it was positive for cladocerans in SC (Table 2). Body size of cladocerans had significantly negative relationship with Secchi depth in WR, of copepods in NC and ER (Fig. 7); in a multiple regression, the relationship for cladocerans was not significant, however (Table 2). Body size of copepods exhibited a significant positive relationship with phytoplankton biomass in ER and WR, but negative in NC (Fig. 7), while in a multiple regression analysis, only significant for ER (Table 2). ZB:PB was significantly negative related with phytoplankton biomass except for ER, but had significantly positive relationship with cladoceran and copepod biomass in all regions (Fig. 8). The ZB:PB ratio was better explained by the zooplankton biomass (R2 = 0.69~0.80) than by the phytoplankton biomass (R2 = 0~0.46). Our results showed dramatically horizontal differences of zooplankton biomass and body size within one very large and habitat diverse lake. The influences of bottom-up, top-down, and hydrological process on zooplankton biomass and body size patterns in this habitat multiple lake, however, had deviant results with individual habitat simplex lakes. Specifically, our observation will be helpful in creating a new understanding of zooplankton distribution in habitat diverse lakes. We found the largest mean zooplankton body size (though still relatively small-sized) in the lotic riverine habitats (SC and NC) with lowest Secchi depths perhaps because the fish foraging efficiency is lower for many fish species in turbid water (Estlander et al. 2009; Zaret and Kerfoot 1975). This observation is consistent with most reports (Brooks and Dodson 1965; Zhou et al. 2018) but inconsistent with some field reports and experiments (Chen and Chen 2017; Schulze 2011). High abundances of small-sized zooplankton have earlier been found in turbulent and high turbidity environmental habitats (Bernot et al. 2004; Vijverberg and Boersma 1997) like floodplains (Baranyi et al. 2002; Bernot et al. 2004; Masundire 1997; Patalas and Salki 1984) and rivers (Davidson Jr et al. 1998; Massicotte et al. 2013; Thorp and Mantovani 2005; Wahl et al. 2008) in different climate zones as well as in experiments (Francesc and Marrasé 2000; G-Tóth et al. 2011). By contrast, Baranyi et al. (Baranyi et al. 2002) found the larger species, like Daphnia cucullata and Ceriodaphnia pulchella, to be more abundant in lentic than in lotic habitats in the Danube River floodplain system. The differences probably due to habitat diversity, because fish can move among habitats, for example, compare with turbid riverine habitat, fish prefer to forage in floodplain. In our lake, the fish community was dominated by potential planktivorous fish. Carassius auratus, Cyprinus carpio, Silurus asotus, and Pelteobagrus fulvidraco are most dominant species in floodplain areas, while Coilia auratus, Hemiculter bleekeri, and Pseudobrama simoni are most dominant species in riverine areas (Yang et al. 2015). Accordingly, floodplain WR had the lowest zooplankton biomass, the smallest zooplankton body size, and the lowest ZB:PB ratio during all years, all indicating that this region faced the highest predation pressure (Havens and Beaver 2013; Havens et al. 2009; Jeppesen et al. 2007). However, large-bodied cladocerans such as Daphnia rarely occurred in any of the regions indicating an overall high predation pressure on zooplankton (Brooks and Dodson 1965; David and Joseph 1990) in summer in this lake, but then particularly high in WR. In addition, Yang et al. (2015) found the WR area had the highest fish density, biomass, and species richness, while ER the lowest, which was also confirmed by Fang et al. (2016). Evidence that predation was responsible for the lack of large-bodied zooplankton in the lake can also be derived from fish-manipulated Lake Junshan (separated from Lake Poyang via a dam built for the purpose of aquaculture). Here, relatively large-bodied Daphnia cucullata was found to dominate the zooplankton community after lake restoration by fish removal (Liu et al. 2015c). Interestingly, we found ER to have the highest zooplankton biomass during all years and it was the only region where this biomass was positively related with the phytoplankton biomass. Moreover, ER was the only region where the ZB:PB ratio was not negatively related with phytoplankton biomass, indicating altogether that bottom-up control was comparatively most important in ER (Brett et al. 2009; Jeppesen et al. 1999). This result is well documented in studies of lentic lakes (Sommer et al. 2012; Straile 2015; Yoshida et al. 2003), especially for studies emphasizing eutrophication (Gagneten and Paggi 2009; Li et al. 2016; Shi et al. 2016). We found a significantly negative relationship between ZB:PB ratio and phytoplankton biomass in the riverine SC and NC, and the slopes of ZB:PB versus phytoplankton biomass were, accordingly, significantly larger (absolute value) than in the other habitats. Turbulence, high turbidity, and high water velocity may reduce zooplankton feeding, growth, and reproduction (Wahl et al. 2008) and thus weaken bottom-up effect in lotic habitats (Havens et al. 2009; Sterner et al. 1996). Horizontally, distribution of zooplankton biomass and body size is also controlled by inter-year variation of water level, which was also observed in particulate organic matter (Liang et al. 2016) and phytoplankton (Liu et al. 2015a, b). Relatively high zooplankton biomass occurred in outlet NC only in high water level season is consistent with observation of Bini et al. (1997) and Marzolf (1990). Besides, we found water depth to have a significant negative relationship with zooplankton body size but positive relationship with zooplankton biomass in NC and WR, which may due to inter-year variation of flow distribution and lentic habitat’s size (Burdis and Hirsch 2017; G-Tóth et al. 2011; Ning et al. 2010). An expanding lake littoral area with increasing water level may support larger zooplankton production. An increasing water level may, however, also offer better sites for fish spawning with a shoreline covered by macrophytes (Naselli-Flores and Barone 1997; Wang et al. 2011). Correspondingly, in accordance with the latter, reports of “People’s Daily” (http://cppcc.people.com.cn/GB/34958/15349412.html) and statements by local fisherman, fish yield of Lake Poyang in the very dry year 2011 drops to less than half of the yield in normal years. In conclusion, our study suggests that habitat heterogeneity and hydrology play important roles in modulating the response of zooplankton communities to top-down and bottom-up control factors: Bottom-up effect turned out to be strongest in lacustrine habitat and weakest in lotic riverine habitat; top-down effects appeared to be highest in seasonally inundated floodplain lands and low in yearly inundated riverine channels. We also found water level variation leads to major inter-year zooplankton body size and biomass of zooplankton. We would like to express our deep thanks to Anne Mette Poulsen from Aarhus University for editorial assistance. This study was financially supported by the National Natural Science Foundation of China (Grant 41671096) and the MARS project (Managing Aquatic ecosystems and water Resources under multiple Stress) funded under the 7th EU Framework Programme, Theme 6 (Environment including Climate Change), Contract No. 603378 (http://www.mars-project.eu).